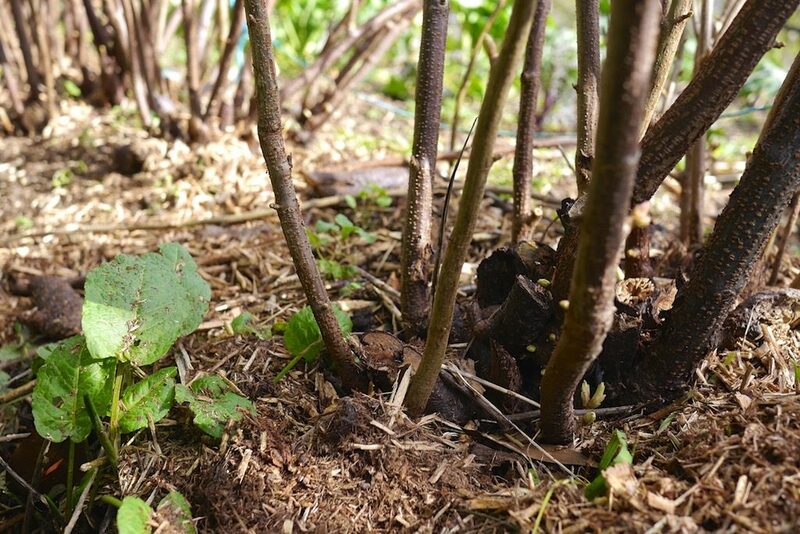 Enokitake are a delicious wild mushroom that’s a great addition to any food growing system, so we were excited to find them growing unannounced in the black currant patch at Melliodora. Time to encourage and cultivate! Talk about stacking functions. 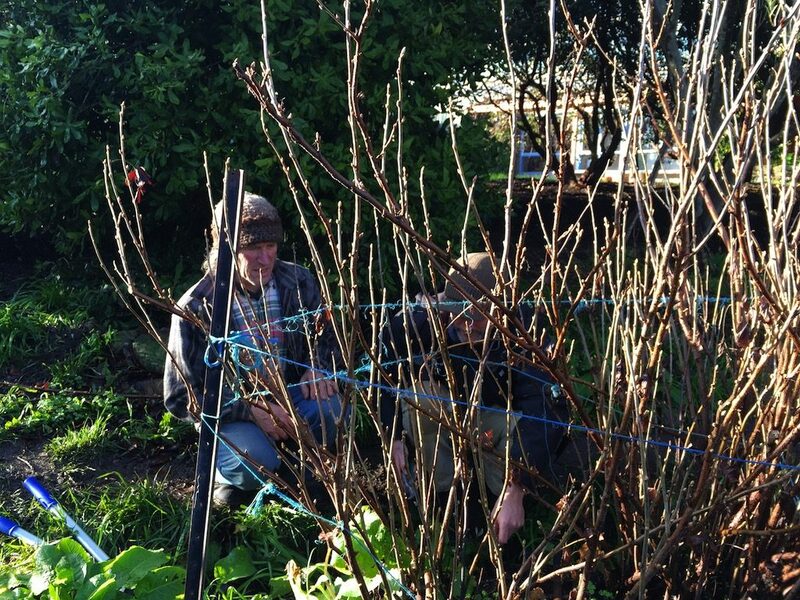 So David was taking Nick through the process of pruning the black currant patch recently, which is one of the many small Winter jobs to be done on this property. 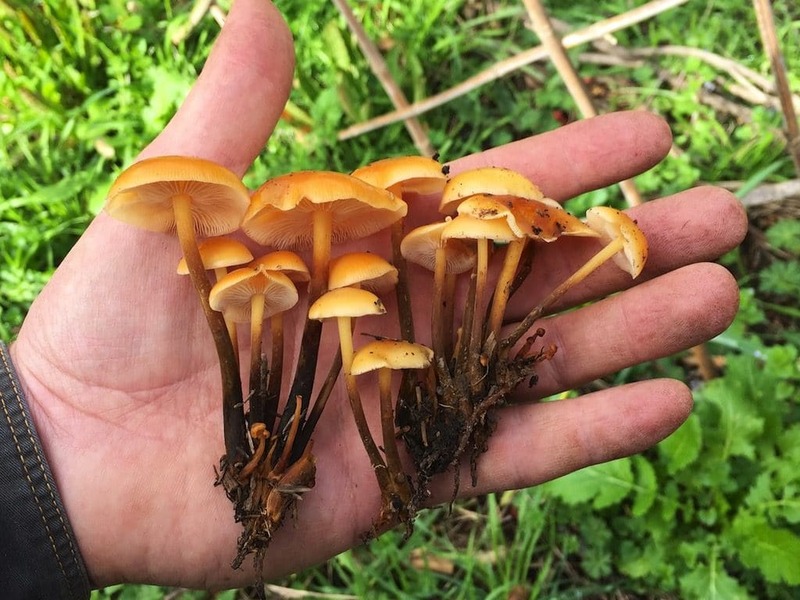 And there at the base of the black currants, Nick recognised what he was pretty sure to be wild Enokitake (Flammulina velutipes) mushrooms fruiting. How excellent. 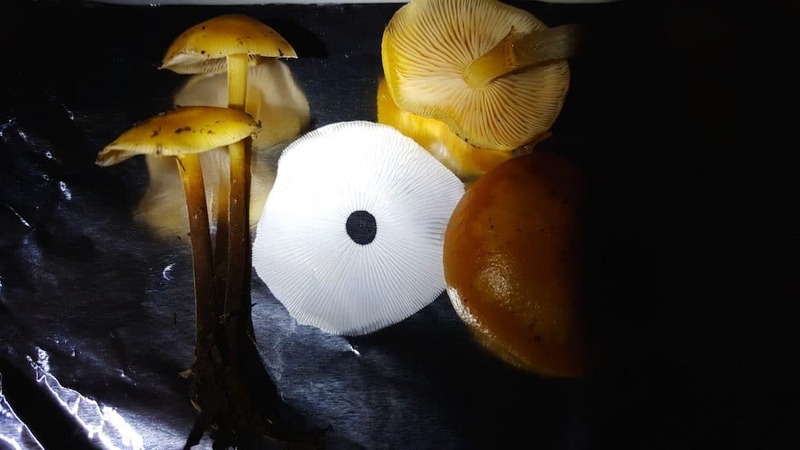 Pretty sure is not good enough when it comes to wild mushrooms, of course, so Nick harvested some and then went through the process of identifying them. Enokitake are also called ‘velvet shank’ and in their wild form you can see why. The colours are gorgeous. Yes, it won’t. Wild enokitake look very different from their poor starved commercial siblings. 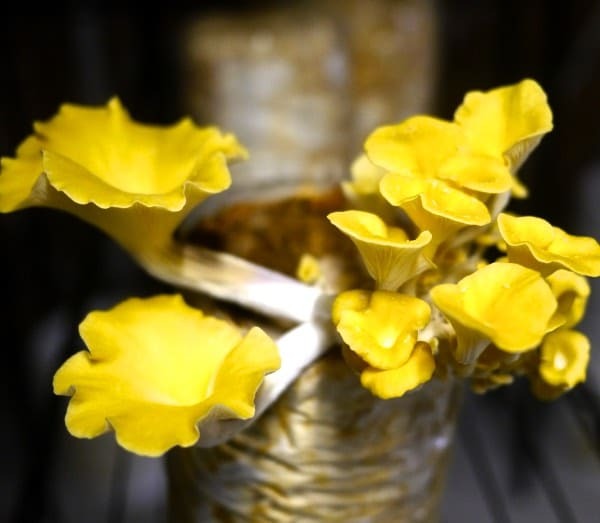 Commercially, enokitake is grown in a CO2 enriched environment to extend their stems and suppress the cap growth, and also grown in the dark to keep them pale. Go figure. I’ll have a plate of the wild ones, thanks. So cool. Infact, enokitake like it downright cold, which is unusual for an edible saprotrophic mushroom. Enokitake have been found on occasion growing out of the snow, and can freeze solid, then unfreeze and continue their life cycle. Wow. 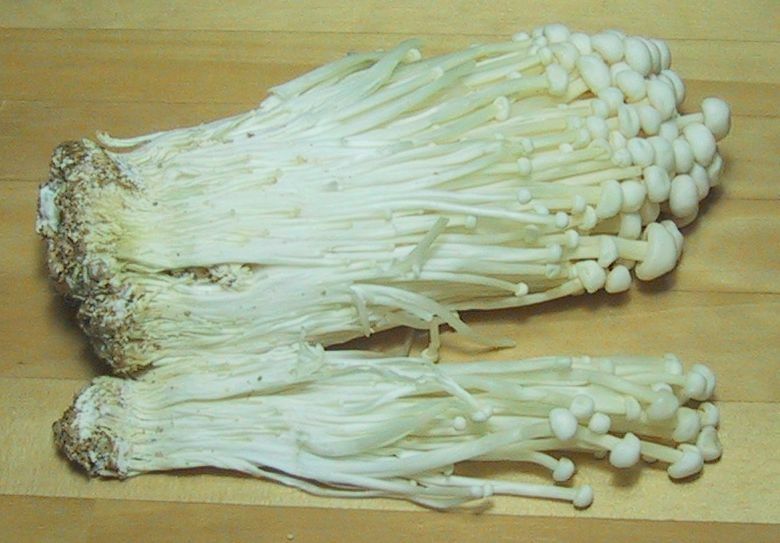 From a low-energy mushroom cultivators point of view, this feature of enokitake is awesome. 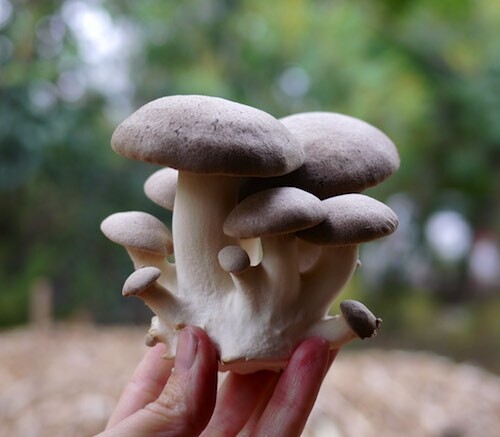 Most other mushrooms will not fruit in cold climates (or at cold times of year) unless you invest in artificial heating systems, which is both an investment and of course uses a bunch of energy. 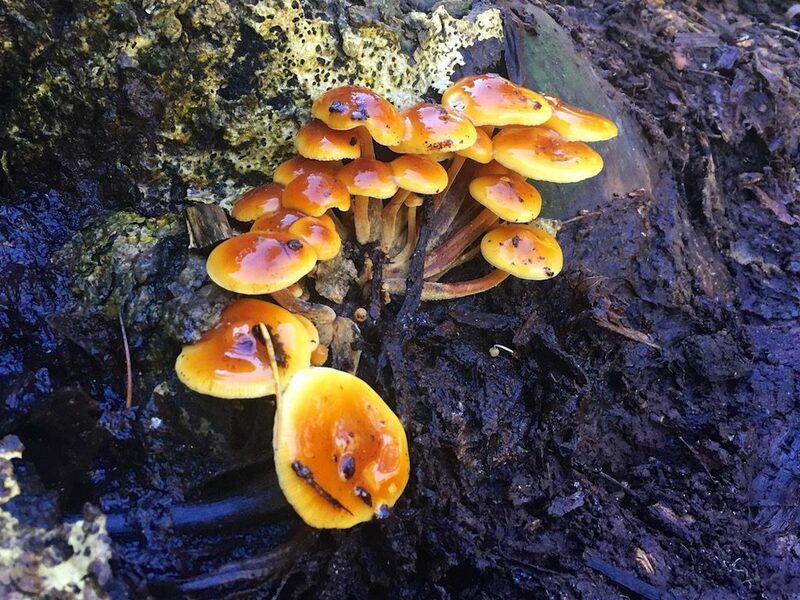 As is the way of these things, once we identified the enokitake growing in the Melliodora currant patch, we started seeing them in other places too, like at our local botanic gardens, growing out of a stump. 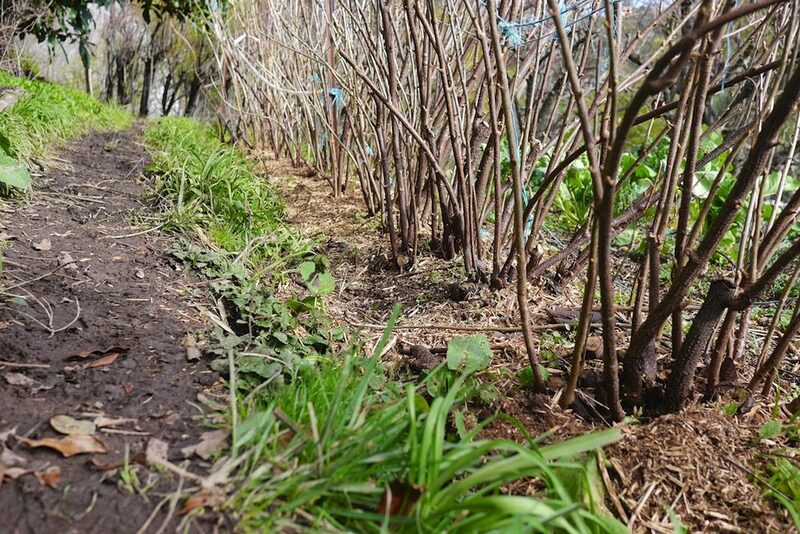 Our strategy to help the enokitake along in the currant patch has a couple of factors. 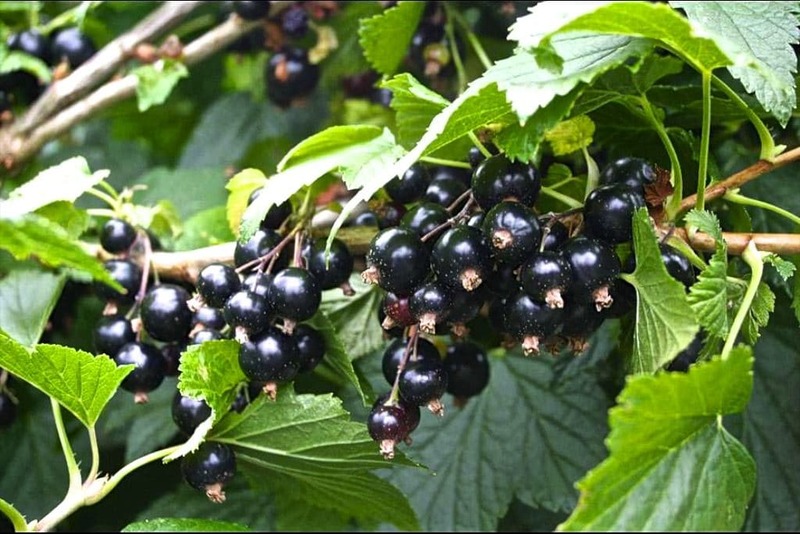 Encouraging – firstly, Nick chipped the prunings from the black currants and spread them back out underneath the same plants, to provide more ideal food for the current (currant?) enokitake mycelium which is obviously quite happy in that location. 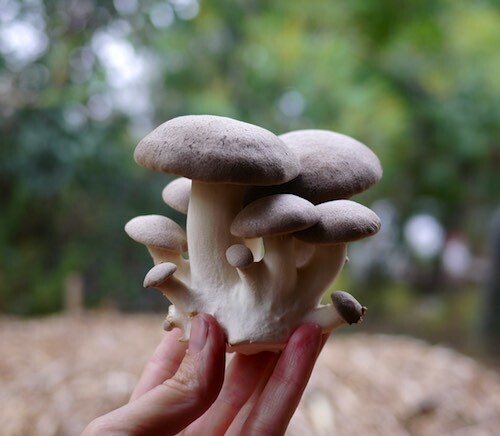 Cultivating – secondly, Nick’s going to have a go at cloning some of the enokitake we found onto agar, and then hopefully make some spawn from that, so we can innoculate some mushroom woodchip gardens with locally adapted enokitake. 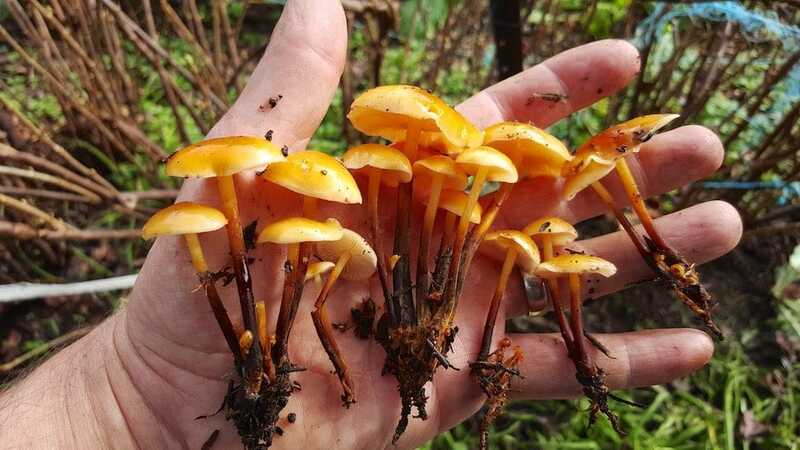 And, fingers crossed, we may have enokitake for many winters to come, popping their gorgeous heads up just when the rest of the wild mushroom season has finished. Yum. Big thanks to Paul Ward, our favourite walking Encyclopedia Botanica (+ Fungi) person who always has useful info and ID-ing tips to share. Cheers matey. 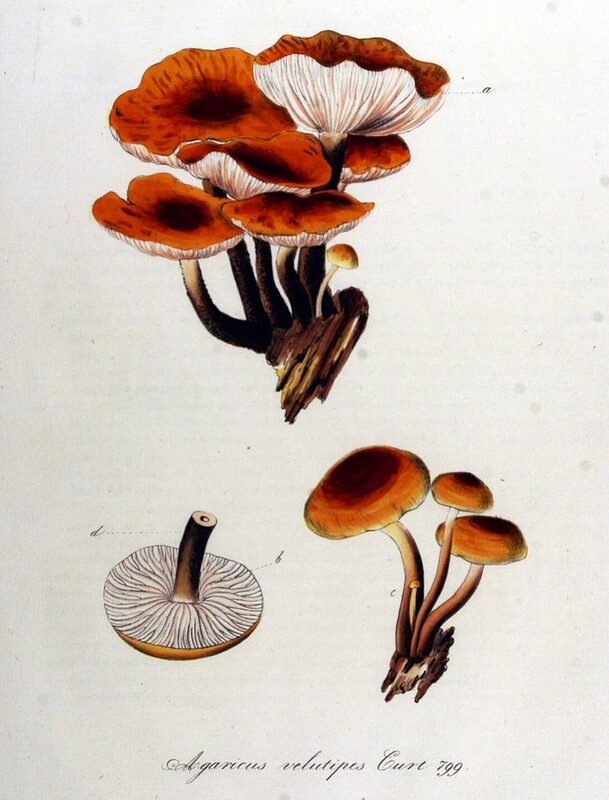 As with any wild food, do not eat a mushroom unless you are completely sure it is the species you think it is, and familiarise yourself with any poisonous lookalikes. For example, make sure what you think are enokitake are not, infact, Galerina marginata, which looks quite similar and is very poisonous. If in doubt, go without. 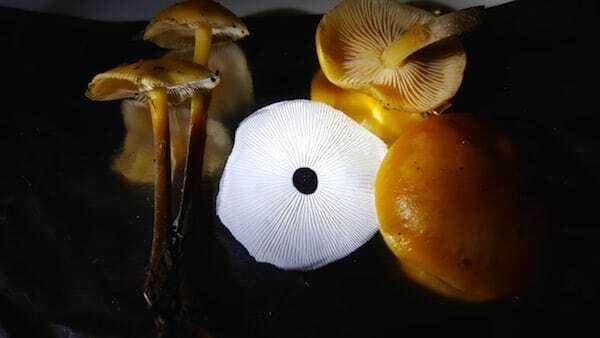 Good info and observation makes for happy foraging. 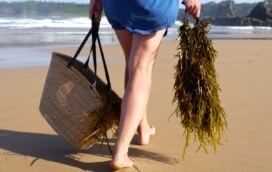 I'm getting cosy with the seaweeds that grow near our place. 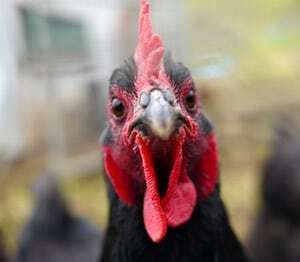 It s . . 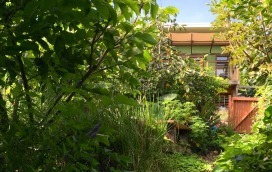 Happy Earth’s Urban Food Forest in Unanderra – it’s grown! 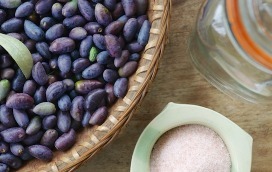 Inspiration takes many forms, but a thriving backyard ecosystem l . .
Tis the season to brine olives! Or salt them, if you prefer. Whe . .